However good your solvent is, for a crystalline solute you cannot get a concentration higher than the "ideal solubility". This is because the solvent first has to virtually melt the solid before the molecules can dissolve. A high MPt and high enthalpy of fusion automatically means a low solubility. 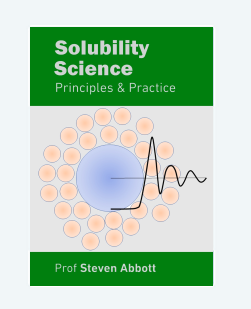 If your formulation needs a solubility higher than the ideal then give up now - it can't be done. The full calculation requires you to know MPt, ΔHf and ΔCp, explained below. So to get a quick feel, turn on the Yalkowsky option; the ideal solubility (as mole fraction x) now depends just on MPt and temperature. For those who want an estimation of solubility in water, the Yalkowsky GSE gives a value if you happen to know the LogKow, the octanol/water partition coefficient. Any solubility approach such as HSP or COSMO-RS can do a reasonable job of explaining why a given molecule is more compatible with a given solvent than with another. However, two molecules with identical solvent compatibility will show very different solubilities if one is low MPt and the other is high MPt. The reason is obvious - to dissolve the molecules, energy has to be provided to "melt" the solid. Only then does that virtual liquid have a chance to interact more or less well with the solvent. Predicting the effects of the crystallinity on solubility is somewhere between hard and impossible. Hard if you have data on the molecules melting behaviour, impossible with no such data. One popular approach which uses melting data is to work out the "ideal solubility" defined as the solubility of the molecule in an ideal solvent, i.e. where there is no enthalpic loss when solvent and solute mix. This is different from the best solvent which might have some positive reasons to interact via, say, acid-base interactions. In these calculations the ideal solubility is expressed in mole fraction, x, of the solute in the ideal solvent at a given temperature. By definition, x=1 at the MPt of the solid. Because not many of us know either ΔHF or ΔCp it is common to use the Yalkowsky approximation based on the one thing we do know, Tm. The app allows you to play with the level of sophistication. With Yalkowsky selected, only Tm is used. To remove the heat capacity effects, set ΔCp to 0. If such an effect is used some curious curves can be obtained - these apparently are sometimes observed. To find the solubility at your desired temperature either read it from the graph with the mouse or set Tmeasure and read value is shown in x @ T. Although the temperatures in the equation are in °K, temperatures in the app are in °C. The take-home message is that low MPt solids are more soluble than high MPt solids. Although that is obvious, the idea of Ideal Solubility is amazingly little-known. Whether the extra information gained from measuring ΔHF and ΔCp is worth having, or whether the Yalkowsky approximation is good enough, only you can decide.